Video already makes up 70% of global internet traffic, but this is set to increase still further. To state the obvious, video is already an extremely popular content medium. But far from plateauing, online video it set to continue its rapid growth. 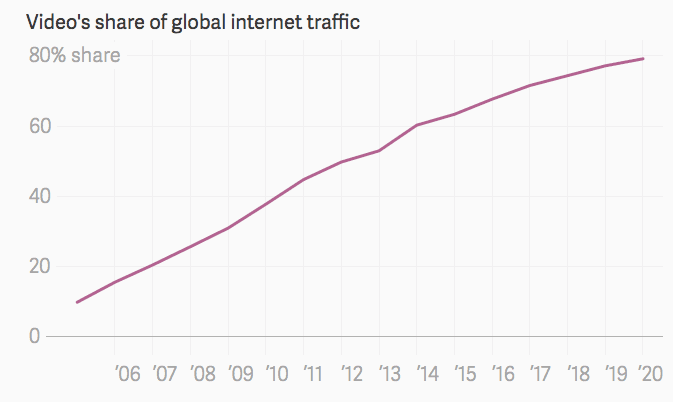 By 2020 it's set to reach an overwhelming 80% share of all global internet traffic. This trend is propelled by two key factors. Firstly there is the growing popularity of on-demand video. Then there is the increasing popularity of video-based social media. This doesn't just mean YouTube. Facebook's push of live video as well as uploaded video, and Snapchat's and Instagram popularity (both of which now involve video) mean increasing views of video content from social platforms. Marketers need to take advantage these trends, and utilise video- whether for marketing or advertising. Exploiting the incredible prominence Facebook is currently giving live video at the moment looks like a promising tactic at the moment - but like all marketing hacks, never forget that once marketers start over-using it then its will effectiveness will inevitably be reduced.